Athens, GA: This summer, Four Athens will maintain the momentum of its expanding youth programs, now active in ten local after school code clubs, by hosting two “camp” experiences for local elementary kids and teenagers. 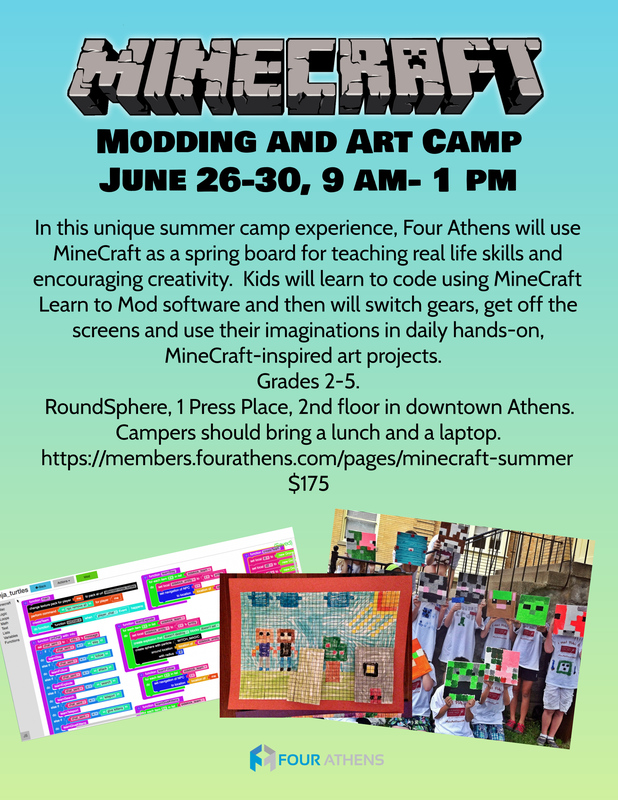 A week-long MineCraft Modding & Art Camp in June will engage 2nd through 5th graders in code instruction as well as daily hands-on MineCraft inspired art projects. At the Teen Tech Experience in July, area high-schoolers will learn to build a functional web app using the popular Ruby programming language over two weeks, plus visit downtown startup companies and UGA departments for innovative workshops focused on job preparation in the technology fields. This year, Four Athens also launched an initiative to raise funds aimed at increasing access to tech education opportunities specifically for middle school aged students. Recent research into STEM education programs reveals a particular vulnerability during the middle school ages for students to lose interest in science and technology topics. This is especially true for girls. The current fundraising campaign has the ambitious goal of raising enough scholarships so that no child interested in learning to code will have to be turned down for lack of resources. More information about the range of tech education opportunities available for area youth and adults through Four Athens is at www.fourathens.com/classes. Four Athens is a 501(c)3 nonprofit fostering entrepreneurship and increasing tech education to improve economic outcomes in Athens. Since forming in 2011, Four Athens has worked to discover startups, build community, connect creativity, accelerate growth and invest in success. More information about Four Athens can be found at www.fourathens.com and on Facebook at facebook.com/fourathens.